The Oppo R7 shares most of its internals with its bigger sibling the R7 Plus. This strikes as kind of odd, as both essentially offer mid-range chips. They are powered by a Qualcomm Snapdragon 615 SoC (MSM8939) with an octa-core CPU clocked at 1.5GHz. This is nowhere near as powerful as most current flagships, but should still suffice for fluid experience. The graphics department is run by an Adreno 405, which should breeze through casual games, but might struggle with heavier titles. Speaking of which, we will update you with the exact performance numbers, as soon as we manage to get through all the benchmarks and work the results out, so check back if you are interested in the synthetic tests. Oppo has opted to put 3GB of RAM in both the R7 and R7 Plus. During the presentation, memory was singled out as a major bottleneck in today's smartphones and 3GB should remedy the fact. This does seem enough, but we still hope the mid-range processor won't throttle overall performance too much. The rest of the specs sheet for the Oppo R7 also includes 16GB of onboard memory and an array of sensors - compass, accelerometer, gyroscope and proximity sensor. 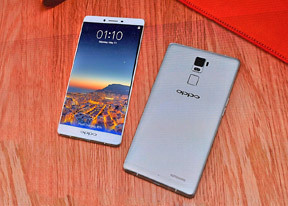 Both devices also have the benefit of Oppo's own VOOC fast charging technology. It definitely stands out among the competition. And while we are on the topic of power, the R7 has a non-removable battery, just like its bigger sibling, but it is quite less spacious with a capacity on 2320 mAh, instead of the whopping 4100 mAh on the R7 Plus. We also need to mention that both phones have LTE connectivity, albeit only for one of the two SIM cards, the other one only has 3G speeds at its disposal. The Oppo R7 is more than just a pretty shell. It shines in the software department as well. Oppo's own Color OS has come a long way and the new version 2.1 is prettier and faster than ever. It is based on Android KitKat, which will later be updated to Lollipop to match the Plus model. The reason Oppo quoted is that work on the R7 began before Lollipop was unveiled. Here are some screenshots of the desktop and app drawer. Even before the update hits the R7 still has the redesigned UI and the new visuals will extend beyond the built-in apps and features an icon pack for about 200 popular applications, so everything appears nice and uniform. Performance improvements are supposedly there as well. Oppo boasts a reduced boot time, from 31 seconds in Color OS 2.0 to just 19 seconds in the new version. The platform is also said to be optimized for faster system app launches. Oppo has also done some optimizations for several popular third-party applications, which should be a lot more fluid. A few more shots of various built-in applications and the theme store. We also have a few shots from the settings menus. All of these software aspects will be discussed at length in our full review later down the road, so stay tuned. 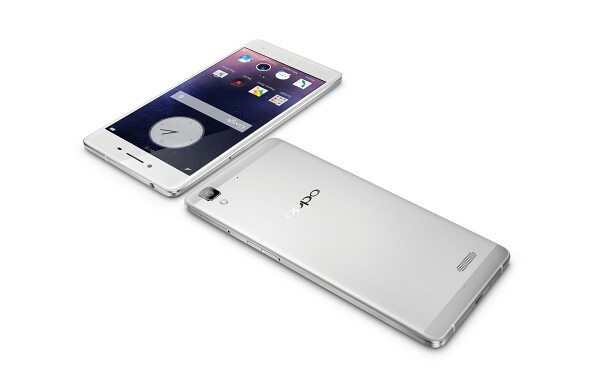 All things considered, the Oppo R7 is shaping up to be quite an impressive mid-range offer. With a sleek all-metal exterior and a price tag of about $400, we can definitely see a lot of appeal with certain users. Both phones launch this month in China, while internationally we should see them around mid-June.